Arrive at least 15 minutes prior to your first yoga class (please note that those arriving late to class will not be allowed into the studio). 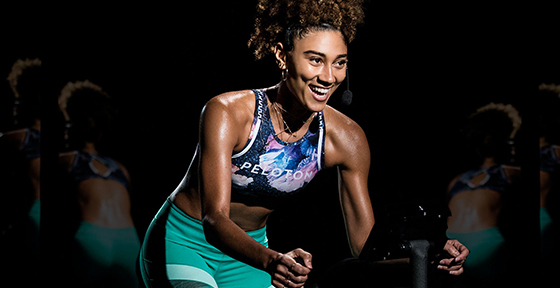 Set up a Peloton account if you wish to track your class participation and progress. You can log in at the front desk upon arrival, as there are no tablets in the Yoga Studio. Dress comfortably in your favorite yoga workout clothes. If you need water, you’re welcome to bring it into the studio. We provide cubbies outside of the studio for your shoes. No shoes are permitted once inside. Additional personal items can be securely stored in the locker rooms. 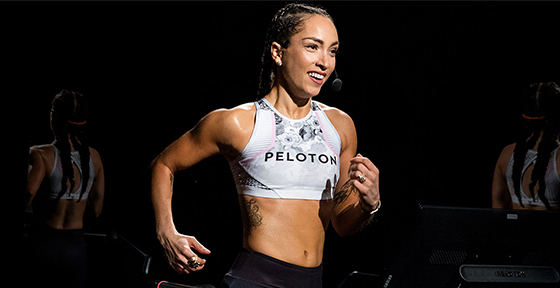 Our classes are live streamed to the Peloton Bike, Tread and Digital worldwide, so please be aware that cameras will be filming in the studio during your class. Say hello to our front desk team, and let them know you’re new to Peloton! Unlike Tread and Cycling, there are no tablets in the Yoga Studio for your to sign in to your Peloton account. If you’d like to log in to track your class participation and progress, you may do so at the front desk. For your safety, you’ll be asked to sign a short waiver before entering the studio. Our front desk team will guide you to the studio. 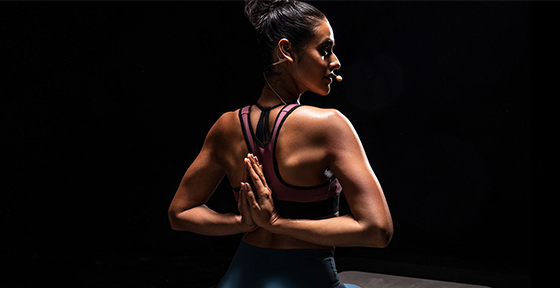 Once in the studio, you will be provided with a Peloton yoga mat and accessories including blocks, blankets, straps and bolsters when required for class. You must be at least 13 years of age in order to participate with partenal consent. Our studio team is here to ensure your first workout with us is motivating, memorable and hassle-free. They’ll help you get you set up for class, whether you need help finding your spot, or getting familiar with the studio or the props. We invite you to leave your worries (and your phone!) in the locker room. After your first Peloton Yoga class, be sure to stay hydrated throughout the remainder of the day. If you experience any unusual or persistent symptoms after your workout, we recommend consulting a medical professional. If you have any further questions about your first class, we’re here to answer them. Give us a call at 646-688-3297. We can’t wait to see you back at the studio! Sign up for your next class and bring a friend! Rejuvenate after class in our spacious locker rooms. Featuring showers, complimentary Malin + Goetz products, shower sandals, towels and hair dryers, you’ll feel refreshed and ready to take on your day.